We love these headphones. These earbuds are, without a doubt, the best sport headphones that exist on Earth (and probably other planets) today. I believe these earbuds are among the items to be shuttled by Space-X capsule to Mars. Have you ever gone for a hike, or run, or bike ride or any other sort of activity only to fight with your headphones from the time you set out until you get home? Struggle no more with Apple included earbuds. 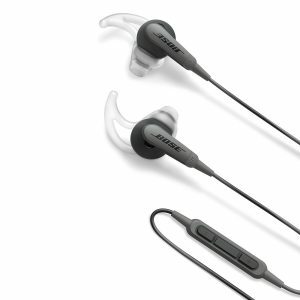 Throw your earbuds away, head on over to amazon because, consider yourself saved, these are the Bose Sport In-Ear headphones. If I had to fault this marvel of human ingenuity, the included earpieces don’t give the noise blocking you would get with more common in-ear buds. 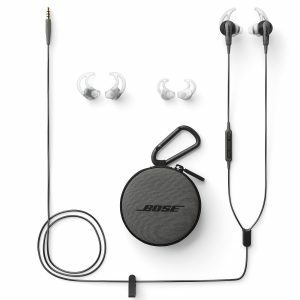 To solve this issue Bose produces these excellent “Stay Hear” tips. 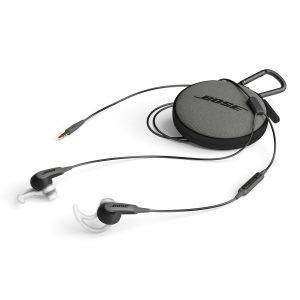 The included ear pieces allow the earbud to simply be suspended inside your ear canal. I found that on windy hikes and bike rides I would experience a bit too much wind noise. The Stay Hear tips do a great job of putting wind-noise at bay while maintaining most of the unparalleled comfort of the included ear tips. Go to Amazon now, buy these. You have never spent $99 on anything better, ever.